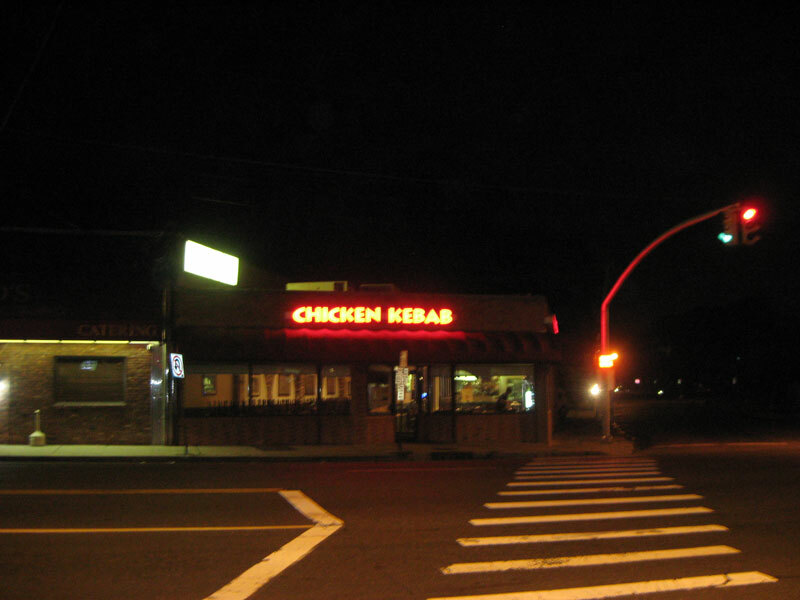 Chicken Kebab is a Turkish restaurant in Rosyln Heights on Long Island. 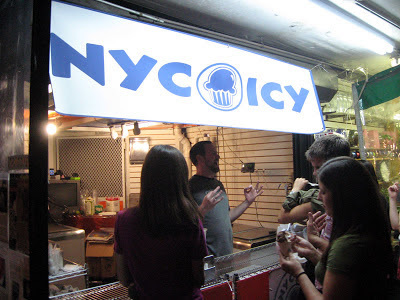 On a recent visit to New York, I found the restaurant by accident and decided to give them a try. The meal started with the House Cold Platter. This consisted of four stuffed grape leaves served with feta, olives, peppers, cucumbers, and tomatoes over an eggplant dip. 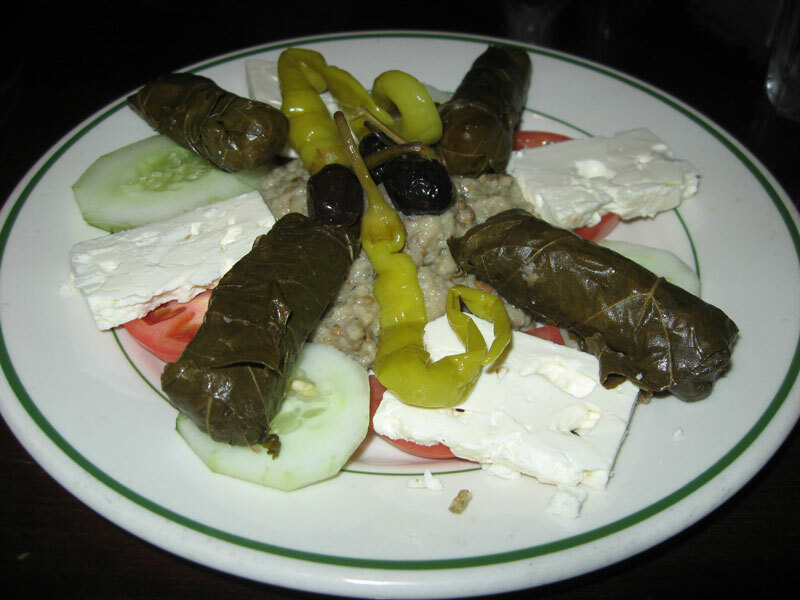 The grape leaves had a nice minty flavor, the cheese was salty, and the baba ganoush was very tasty. 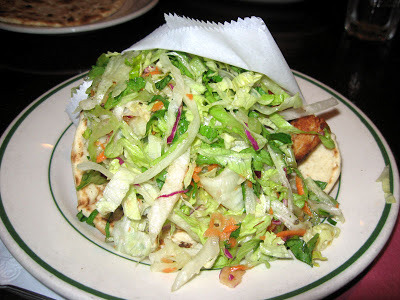 For my main course, I had the Chicken Gyro which was both massive and delicious! It was actually one of the most overstuffed gyros I've ever seen. When it was served, the gyro almost looked like a salad. Hidden below all of the greens, there was an abundance of thinly sliced chicken. When I managed to pick up this overflowing gyro and take a bite, I had nothing bad to say. The chicken was tender and had great flavor. The greens gave a nice crunch, and when I added some tahini, this became one of the best gyros in my recent food memory! I ate dinner at Lings Buffet in Lakeland. Lings is a good sized Chinese buffet and was very busy, which is good since that means there's a good turnover on the food. Lings actually had a really nice selection of sushi for a buffet, and there were actually lots of people eating it. I had various rolls, edamame, and a nice radish salad. Overall, Lings was a pretty good Chinese buffet. It was a little on the expensive side at $13.95, but they had a nice selection of food. How many other buffets out there have frog legs? 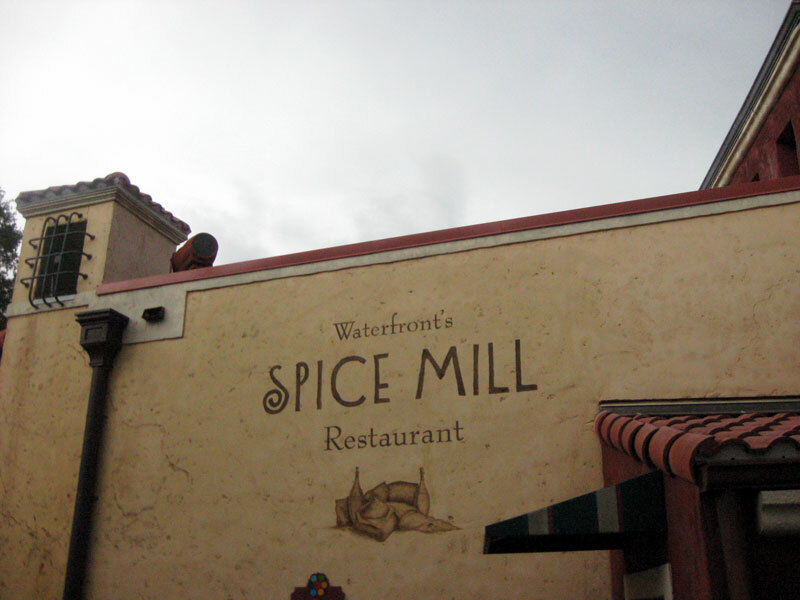 During a visit to Sea World in Orlando, I had lunch at the Spice Mill Restaurant in the Waterfront section of the park. 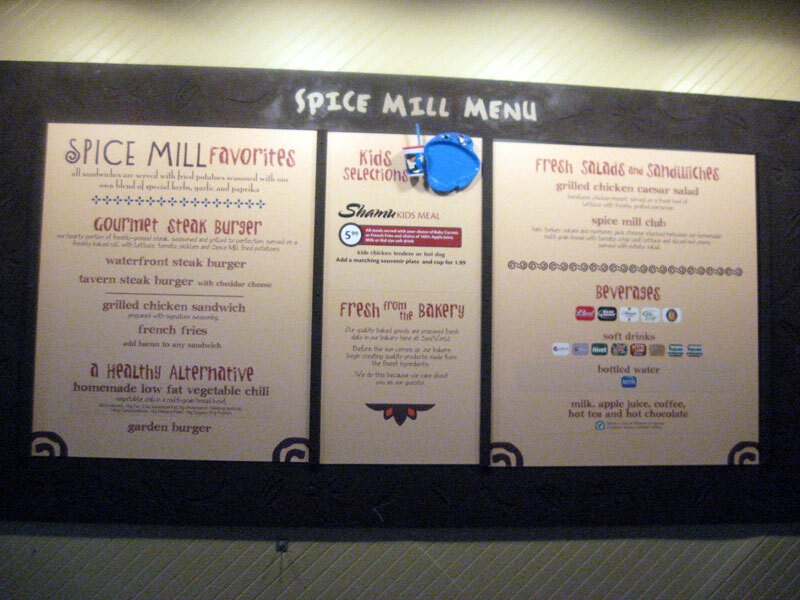 I had the Spice Mill Club. 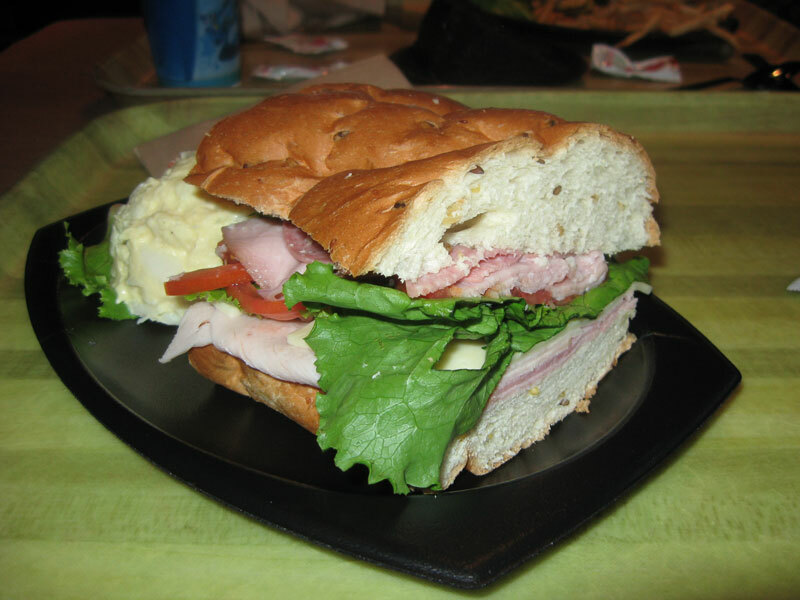 This sandwich consisted of ham, turkey, salami, monterey jack cheese, lettuce, and tomato on a multi-grain bread. Potato salad was served on the side. Overall, I enjoyed my meal. The sandwich was good, especially since Sea World's food can sometimes be hit or miss (especially in the past- they have improved their food in the past few years). 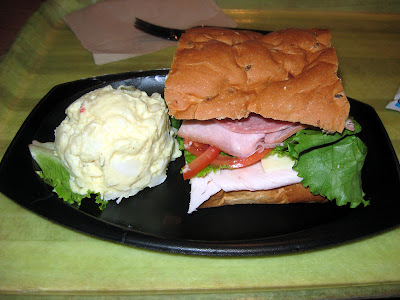 It was a good sized sandwich compared to the small hamburgers and chicken sandwiches that Spice Mill also sold. 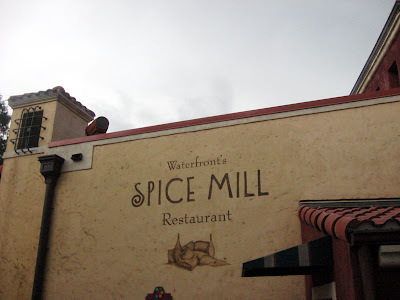 I don't visit Sea World often, but I'd gladly eat at the Spice Mill again on my next trip to the park! During a recent bit of traveling, I stopped for dinner in Woodbridge, VA and ate at a fast food Japanese restaurant called Bento Cafe Sushi & Roll. I had their California Roll Combo which came with miso soup, fried dumplings, and the California roll. While the food was good, there was also a not-so-good aspect to the restaurant. The restaurant's owner seemed to be caught up in a multi-level marketing scheme and was desperately trying to sell an alkaline water machine to her customers. In fact, the sales pitch started as soon as we walked in the door with the mention that they make their own water. Somehow I didn't think they were bonding hydrogen and oxygen in the back of a fast food restaurant. Apparently the wonderful tap water produced in the United States is evil, but if you run the tap water through a machine that claims to ionize the water to make it more basic, it turns into a cure-all. Rotelli is a small Italian restaurant chain with locations mostly in South Florida. 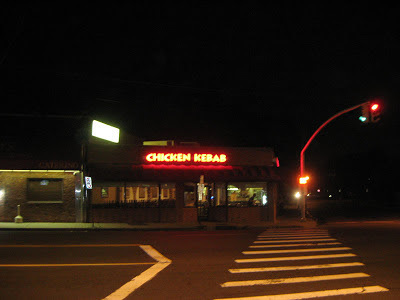 I've visited a few of their locations in the past, and the food has been hit or miss. I recently ate at their store in Deerfield Beach and it was a good experience!. The meal started with some Garlic Knots. Pizza was the main course. As far as chain pizza goes, this spinach pie was pretty good. The crust was nice and crispy. There was plenty of spinach on top of the right amount of cheese. The sauce was too sweet for my liking, but otherwise the pizza was tasty! I ordered the Jumbo Soft Shell Crab Sandwich. Deep fried in a Cajun flavored batter, this soft shell crab was served on a bun with lettuce, tomato, onion, and cheese. A pickle and really tasty fries came on the side. I'm always slightly uncomfortable with that initial bite of a soft shell crab. Eating an entire crab is very different than just eating it's meat. Once I get past that first bite though, I'm good. This crab had great flavor, crispy on the outside, but nice and juicy on the inside! One warning though, beware of the mosquitoes if you're eating outside at dusk! In Manhattan's East Village, there is a restaurant called Mini Thai Cafe. It had been a really long time since the last time I had Thai food, plus they had some good dinner specials that brought me into the restaurant. The meal started with a Spring Roll appetizer. These were typical spring rolls, but the presentation was nice, served in a big glass on a bed of vegetables with duck sauce on the side. I had the Vegetable and Tofu Thai Noodle Soup for my main course. The big bowl of soup was filled with tofu, cabbage, carrots, broccoli, and lots of noodles. The soup was good on it's own, but it got even better with the addition of some of the chili paste that was brought to the table! My bowl of soup was under $10, so I can't complain. It was plenty to eat and was very tasty. Athenian Garden is a new Greek restaurant in Heathrow. Positive things were being said about the restaurant on other food blogs, so I gave them a try. I had a coupon for some free burgers, so I gave them a try. Burgers are perhaps one of my least favorite types of sandwiches, so I may not be a good authority on if this was any good or not. Regardless, here's what I thought: I wasn't impressed. The thin meat patty had the consistency of cardboard with no flavor. The only thing that really had a distinct flavor on this burger was the ketchup and the pickle. I really don't get what the big deal is with White Castle burgers. 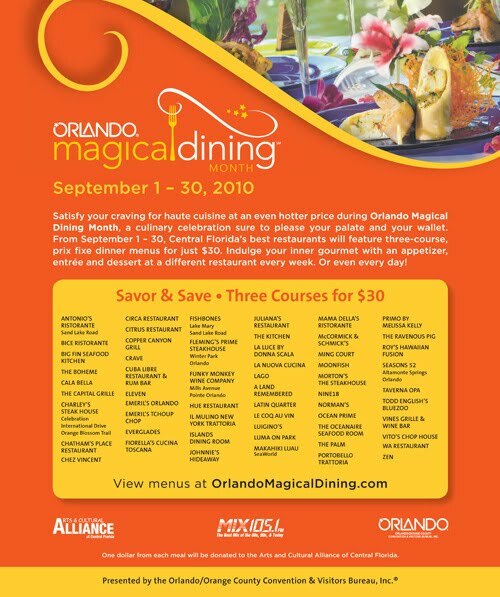 September is Orlando Magical Dining Month! Over 60 restaurants all over Orlando are offering three course meals for $30. 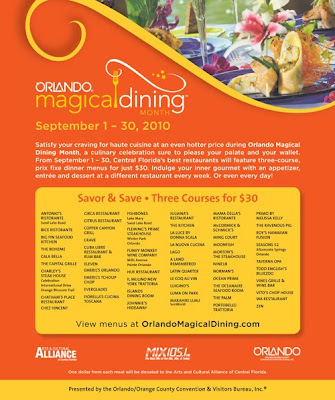 You have until September 30 to get a great deal at some of Orlando's best restaurants. Hurry! Late one night in Manhattan's East Village, I stopped for some Italian ice at a small shop called NYC Icy. 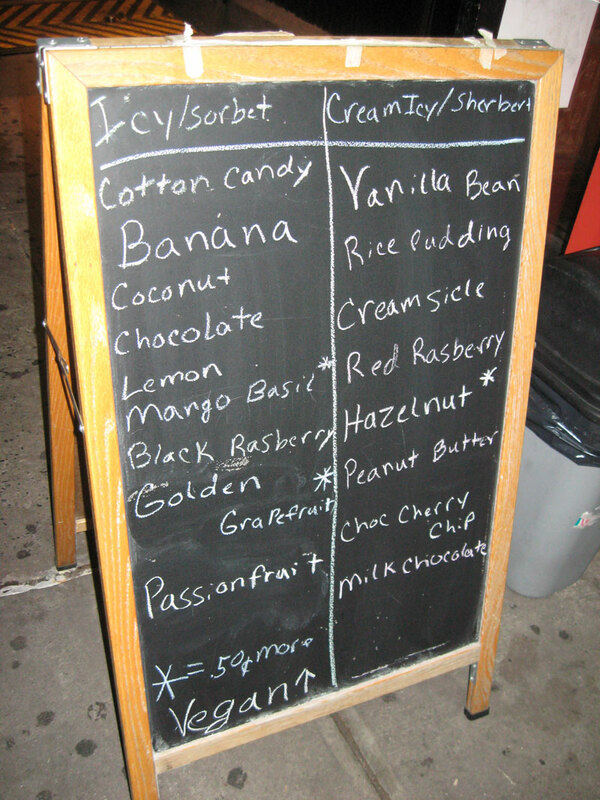 Some of the flavors on the menu were really interesting. I ended up getting lemon and mango basil. 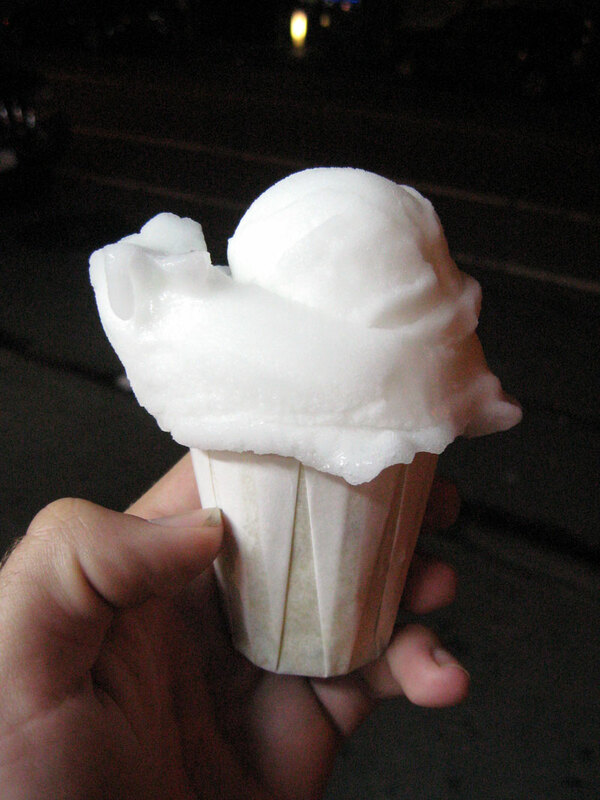 The ices had a different consistency compared to other places. They were almost gooey. I'm not sure how exactly this was done, but I liked it. The lemon was good and tart, as it should be. 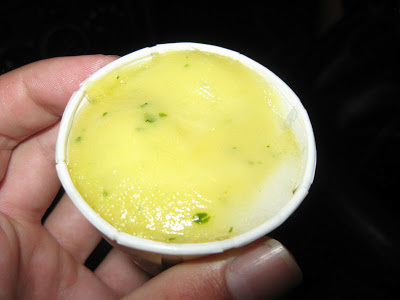 The mango basil ice was hidden beneath the lemon. Mango basil isn't a dessert combination that I would normally think of, but this was really good.